A little over a month ago I decided to start doing reviews of books written by fellow WP bloggers. Although I didn’t announce it, I also decided to also look into reviews of CDs by fellow bloggers. Here is my first music review, at least the first one for a fellow blogger. 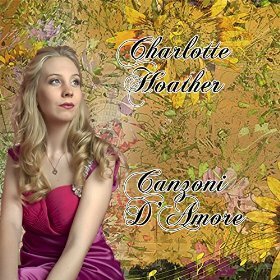 Canzoni D’Amore, an album by soprano Charlotte Hoather, is a mix of art songs/lieder and opera aria. Most of the music is relatively “safe”. You won’t find any of Webern’s lieder or an aria from Berg’s Lulu here. The music being very accessible is understandable for this type of an album. I recognized most of the music, but I wished there was composer info in the files. I’ll admit I am not not an expert on vocal music. I often read reviews and am amazed at how detailed, and picky, some people can be over the voices on the CD. I spend my time mostly with instrumental music and am only a casual listener to vocal music. So, from my very non-expert opinion I really like Ms. Hoather’s voice even if I can’t go into the type of detail some would. Her voice is very expressive, though I think she is sometimes more expressive on the live performance videos she’s posted on her blog. That, of course, goes without saying – she draws energy from the audience the way any good performer should. Overall I found the quality of the music fairly high, though noted a few inconsistencies. They were few and far between but my ear occasionally picked up something that wasn’t quite there. These little spots didn’t detract from Ms. Hoather’s beautiful voice, but I want to explain why this isn’t a 5 star review (on Amazon I gave this 4 stars). I liked this CD and think Ms. Hoather has a very nice voice. She’s still a student so it should only get better over time. In the meantime, this is a very enjoyable CD of very listenable music. You can find the CD (actually mp3 download) on Amazon here. For other options, go to Ms. Hoather’s blog. This entry was posted in Music, Music Review and tagged art song, CD, CD Review, classical music, lieder, Music, opera, product review, review on February 9, 2015 by trentpmcd. Thanks for reviewing Charlotte’s CD. Looking for rvs of it brought me to your blog, which I’ve been pottering about in. I got to know Charlotte through blogging and I’m so impressed by her work ethic and her grounded attitude to her studies, let alone her voice. I do know something about singing and the voice in general and I think her voice is very mature for her age. I’m looking forward to seeing where she goes with it. If you’re interested in other forms of music, by the way, go and have a look at Thom Hickey’s blog The Immortal Jukebox. His current post about Johnny Cash and Brother Claude Ely is really something. Hi, thanks for stopping by! My pleasure reviewing Charlotte’s CD. I enjoyed listening to it. She is very talented and has charisma, which is very much needed by a performer. I’m also interested in how her career will progress. I might stop by and check out The Immortal Jukebox later. I’m very eclectic in my tastes. Thank you first of all for downloading my first cd recording and a double thank you for taking the time to review it😊. It’s been quite daunting to try to raise money towards my on-going training I’d like to assure you I will put it to good use to improve and grow.